From my extensive research (ok...not so much...just my opinion) people either love 'em or they hate 'em. There's not usually a middle ground. 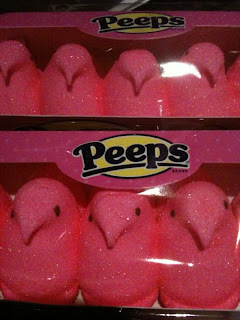 So tonight as I strolled through WalMart with my mom we decided that the best way to deal with our feelings after hearing that we are getting MORE SNOW tonight and tomorrow....PEEPS were the answer to feeling better about things in general! Then we stood there at the Peeps display deciding which color peeps would do the trick. I ended up with the hot pink ones. I made it all the way out to my car before tearing the package open and eating 3 of them in quick succession! "What then?" you might ask.... Well as I savored those little pink confections I could almost close my eyes and feel the warm spring breeze blowing across my face while I floated back and forth in my trusty hammock all the while feeling the sun on my face and smelling the fresh cut grass. (It had to be said....even in a "run on" sentence). So...I'm heading upstairs to put on my flannel pj's AGAIN and maybe tonight I'll dream of spring. I LOVE MckMama! There I said it. Love her blog and all of her beautiful photos, stories and mostly I love her honesty! She's got an awesome giveaway today! Head on over to the link below to check it out! Crossing my fingers that I'll be a WINNER!! I'm drooling!!!!! It's SO cute!! Win a Kelly Moore Camera Bag from MckMama right here: http://tinyurl.com/yk63g92 Head over to comment (and RT this to earn a SECOND entry!). Marley LOVES the snow! He didn't want to go back inside the house. Well....we are still reeling from all the snow. Looks like 30" is the final total here at our house. Unbelievable! Mike and I went out and shoveled for about 3 hours last night and we got a lot done. We were really blessed to be able to borrow a snow blower from our neighbors Jim and Terri. We still have a mountain at the end of the driveway that's hip deep to dig through today. The good news is that the sun is up so maybe that will help soften up the top layer at least. The bad news....they're calling for MORE SNOW on Tuesday and Wednesday!! Ugh! Thanks Puxatawney Phil!!! Six more weeks of winter is NOT what I wanted to hear! !